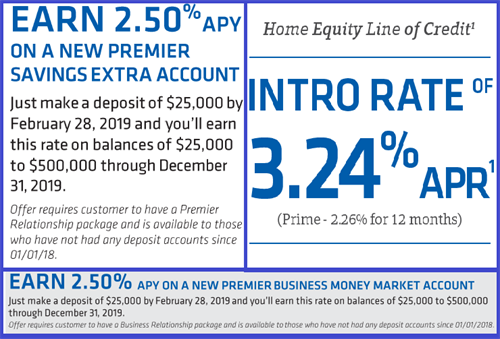 Name: Webster Bank - 2.50% APY new personal or business savings account rate thru 12/31/19 and 3.24% (prime-2.26%) intro for 12 months on Home Equity Line of Credit*!! Earn 2.50% APY on a new premier savings extra account or business money market - make a deposit of $25,000 by February 28, 2019 and you'll earn this rate on balances of $25,000 to $500,000 through December 31, 2019 - exceptions sometimes available for amounts over $500,000. 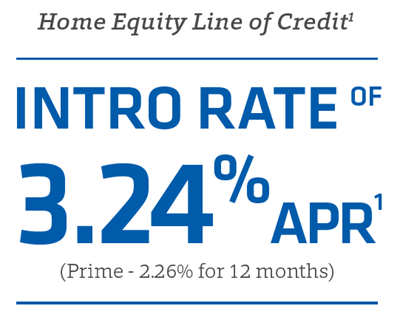 Home Equity Line of Credit - INTRO RATE of 3.24% APR (Prime - 2.26% for 12 months)*! Please call Dayna Bouvier at 203-869-0753 or see details below for more information. Karelys Lopez or Alea MacCallum can also assist. CUSTOMER IS ELIGIBLE TO RECEIVE EITHER THE CHECKING CASH OFFER OR THE PREMIER SAVINGS EXTRA/CD RATE OFFERS. CUSTOMERS ELECTING THE CHECKING CASH OFFER ARE INELIGIBLE FOR THE PREMIER SAVINGS EXTRA/CD RATE OFFERS. CUSTOMERS ELECTING THE PREMIER SAVINGS EXTRA/CD RATE OFFERS CAN TAKE ADVANTAGE OF BOTH THE SAVINGS AND CD OFFER BUT ARE INELIGIBLE FOR THE CHECKING CASH OFFER. THE CHECKING AND PREMIER SAVINGS/CD OFFERS CANNOT BE COMBINED IN ANY WAY AND ARE LIMITED TO ONE PER HOUSEHOLD. PREMIER CHECKING $300 CASH OFFER: Promotion valid for new checking accounts opened between 01/01/2019 and 02/28/2019 at the Webster Banking Centers located in Ridgefield, Wilton, Danbury, Stamford, Darien, Norwalk, and Greenwich, CT and Larchmont, Scarsdale, Yonkers, Rye, White Plains, and New Rochelle, NY and meeting minimum opening balance requirements. Customer must qualify for account and have a direct deposit of $500 or more (Direct Deposit transactions are limited to payroll, social security, pension, and government benefits. PayPal® transactions are excluded) between the month the account was opened and 07/31/2019. OR Customer must have an average account balance greater than or equal to $10,000 for the calendar month ending 07/31/2019. To be eligible, the primary customer must qualify for Premier Checking and must not have had an open checking account since 01/01/2018 at Webster Bank. Account must be in good standing at the time of payment; an account is considered to be in good standing if it has a positive balance and is not in the process of being closed. All funds will be transferred into the newly established checking account by 09/19/2019. All amounts will be reported to the IRS, and customer is responsible for any applicable taxes. Customer must be a resident of NY, MA, RI, or CT at time of account opening and promotion payout. Please speak to a Webster banker for details. Rates shown for any product or tier are subject to change at any time. Cannot be combined with any other Webster Bank cash incentive offer. Premier Checking. Minimum opening deposit of $500 is required. You can avoid a $21.95 monthly maintenance fee by keeping $20,000 in combined monthly average checking, money market, and savings balances or $50,000 by adding CDs, home equity, and installment loan balances as of the end of your statement period, and monthly average investment balances (excluding the last day of the month). Fees may reduce earnings. Premier Checking is a tiered-rate product. The tiers are $0.01 to $2,499.99, $2,500.00 to $9,999.99, $10,000.00 to $24,999.99, $25,000.00 to $49,999.99, and $50,000.00 and over. The APY (Annual Percentage Yield) for Premier Checking as of 12/18/2018 is 0.01% for balances of $0.01 to $49,999.99 and 0.02% for balances $50,000.00 and over and is subject to change at any time. Free ATMs Anywhere. For Premier Checking accounts, Webster will not charge any fees for checking withdrawals at non-Webster ATMs and if you are charged a fee by another bank for checking withdrawals at its ATM, we will rebate the fee. Tax reporting may apply. Product features are subject to change at any time. PREMIER SAVINGS EXTRA 2.50% OFFER: Premier Savings Extra offer is effective as of 01/01/2019 and is good for accounts opened by 02/28/2019 at the Webster Banking Centers located in Ridgefield, Wilton, Danbury, Stamford, Darien, Norwalk, and Greenwich, CT and Larchmont, Scarsdale, Yonkers, Rye, White Plains, and New Rochelle, NY. Offer is available to new deposit customers only. Offer not available to financial institutions. A new customer is one who has not had any deposit accounts after 01/01/2018. Existing funds at Webster Bank are not eligible to receive the promotional rate offer. To be eligible, the account holder must open and maintain a Premier Relationship package, which includes a Premier Checking and Premier Savings Extra account. The primary account holder must be the same on both accounts. A minimum opening deposit of $25,000.00 to the Premier Savings Extra account is needed and must come from a source other than Webster. Minimum balance to earn 2.50% Annual Percentage Yield (APY) is $25,000.00. Through 12/31/2019 accounts with balances of $0 to $24,999.99 will earn a rate of 0.10% APY. Accounts with balances between $25,000.00 to $500,000.00 will earn a rate of 2.50% APY. Any accounts with balances in excess of $500,000.00 will earn a rate of 0.85% APY on the entire balance. Interest is credited and compounded monthly. This product is a tiered rate product. Tiers and standard rates as of 12/18/2018 are as follows: $0.01 to $24,999.99 – 0.15% APY, 25,000.00 - $49,999.99 – 0.30% APY, $50,000.00 - $99,999.99 – 0.40% APY, $100,000.00 - $249,999.99 – 0.50% APY, $250,000.00 and up – 0.55% APY. Tiers and standard rates are subject to change at any time. Fees may reduce earnings. WEBSTERONE RELATIONSHIP CHECKING: Minimum opening deposit of $50 is required. There is a $16.95 (or $14.95 with direct deposit) monthly service charge, waived with $4,000 in combined average checking, money market and savings balances during your monthly statement period, or $20,000 adding CD, home equity and installment loan balances (excludes mortgages) as of the end of your statement period. The APY (Annual Percentage Yield) for WebsterOne Relationship Checking is subject to change at any time. Bank rules and regulations apply. Rates and fees may vary by state and region. See a banker for details. CD OFFER: 24 Month CD earns 3.00% Annual Percentage Yield (APY); Minimum balance to open account is $1,000 and must come from a source other than Webster. A penalty may be imposed for early withdrawal. Premier Checking or WebsterOne checking account is required. Interest is credited and compounded monthly. The offer is effective as of 01/01/2019 and good for accounts opened by 02/28/2019. This offer is not available to financial institutions. TAKE ADVANTAGE OF BOTH THE MONEY MARKET AND CD OFFER BUT ARE INELIGIBLE FOR THE CHECKING CASH OFFER. THE CHECKING AND PREMIER BUSINESS MONEY MARKET/CD OFFERS CANNOT BE COMBINED IN ANY WAY AND ARE LIMITED TO ONE PER BUSINESS TAX ID. 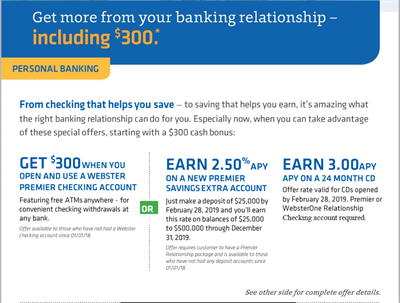 WEBSTER COMPLETE BUSINESS CHECKING $300 OFFER: Promotion valid for new Webster Complete Business Checking accounts opened between 01/01/2019 and 02/28/2019 at the Webster Banking Centers located in Ridgefield, Wilton, Danbury, Stamford, Darien, Norwalk, and Greenwich, CT and Larchmont, Scarsdale, Yonkers, Rye, White Plains, and New Rochelle, NY, and meeting minimum opening balance requirements. Business customer must qualify for the account and complete the following by 07/31/2019: 1) make cumulative deposits of $5,000 or more OR 2) complete a total of 6 deposits into the newly opened Complete Business Checking account. To be eligible, the primary business customer must not have had an open checking account since 01/01/2018 at Webster Bank. Offer not available to sole proprietors who have had personal accounts since 01/01/2018. Account must be in good standing at the time of payout; an account is considered to be in good standing if it has a positive balance and is not in the process of being closed. All funds will be transferred into the newly established checking account by 09/19/2019. Amounts will be reported to the IRS, and customer is responsible for any applicable taxes. Customer must be a resident of CT, MA, NY, or RI at time of account opening and promotion payout. Please speak to a Webster banker for details. WEBSTER COMPLETE BUSINESS CHECKING. Minimum opening deposit of $500 is required. The $21.95 monthly service charge can be waived by maintaining a monthly average balance of at least $7,500 in up to 3 linked Webster Complete Business Checking accounts (the “relationship package”). You may create a relationship package of up to 3 Webster Complete Business Checking accounts. The aggregated monthly average balance of these accounts (the “relationship package”) will be calculated to determine if the account designated as the Primary is entitled to a service charge waiver based on maintaining the monthly average balance required to avoid the monthly service charge for that statement period. Secondary linked accounts will always be free of the monthly service charge, provided a primary account is present. Authorized signers on any of the accounts are entitled to determine which accounts are included in the relationship package provided that they are a signer on each of the accounts they designate. Accounts can be added or removed at the sole discretion of the signers on the individual accounts in the relationship package. If you remove or close the Primary account in the relationship, it will result in dissolving the relationship package and subject each account to the monthly average balance requirement to waive the monthly service charge. In addition, removal of one of the secondary accounts from the relationship, by a signer, may result in the Primary account being subject to a service charge without notice to all other signers, should the monthly aggregated balances fall below the balance to waive threshold. Other miscellaneous fees may apply. Webster Complete Business Checking ATM. With Webster Complete Business Checking, Webster will not charge any fees for checking withdrawals at non-Webster ATMs, and if you are charged a fee by another bank for checking withdrawals at its ATM, we will rebate the fee. Tax reporting may apply. Product features are subject to change at any time. PREMIER BUSINESS MONEY MARKET 2.50% OFFER: Premier Business Money Market offer is effective as of 01/01/2019 and is good for accounts opened by 02/28/2019 at the Webster Banking Centers located in Ridgefield, Wilton, Danbury, Stamford, Darien, Norwalk, and Greenwich, CT and Larchmont, Scarsdale, Yonkers, Rye, White Plains, and New Rochelle, NY. Offer is available to new customers only. Offer not available to financial institutions. A new customer is one who has not had any deposit accounts after 01/01/2018. Existing funds at Webster Bank are not eligible to receive the promotional rate offer. To be eligible, the account holder must open a Business Relationship package which includes a Complete Business Checking account or a Commercial Checking for Small Business account and a Premier Business Money Market account. The primary account holder must be the same on both accounts. A minimum opening deposit of $25,000 to the Premier Business Money Market account is needed and must come from a source other than Webster. Minimum balance to earn 2.50% Annual Percentage Yield (APY) is $25,000. Through 12/31/2019 accounts with balances of $25,000 to $500,000 will earn a rate of 2.50% APY. Any accounts with balances in excess of $500,000 will earn a rate of 0.85% APY on the entire balance. If the balance falls below $25,000, the rate will be 0.10% APY. Interest is credited and compounded monthly. This product is a tiered rate product. Tiers and standard rates as of 12/18/2018 are as follows: $0.01 to $9,999.99 – 0.05% APY, $10,000 to $24,999.99 – 0.10% APY, $25,000 to $49,999.99 – 0.15% APY, $50,000 to $99,999.99 – 0.20% APY, $100,000 and up – 0.25% APY. Tiers and standard rates are subject to change at any time. Fees may reduce earnings. CD OFFER: 24 Month CD earns 3.00% Annual Percentage Yield (APY). Minimum balance to open account is $1,000 and must come from a source other than Webster. A penalty may be imposed for early withdrawal. Business checking account is required. Interest is credited and compounded monthly. The offer is effective as of 01/01/2019 and good for accounts opened by 02/28/2019. This offer is not available to financial institutions. Offer available now through February 28, 2019!